The included plugins may be a mixed bag, but Mixcraft 7 is a capable DAW that gives the pricier competition a run for its money. 64-bit, at last. Performance Pads are a blast. Step sequencer for easier beats. Multiple automation lanes. Useful, high-quality instruments & effects. Audio warping. Samplers are very basic. 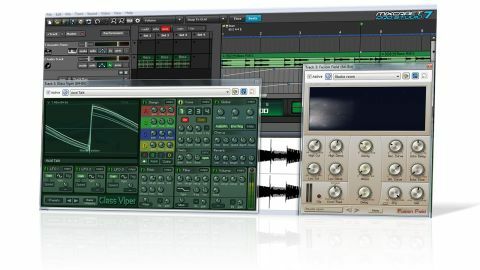 Some plugins are available as freeware. Acoustica's Mixcraft (check out our Mixcraft Pro Studio 6 review from October 2012) is a 'budget' Windows DAW with a sizeable collection of bundled instruments and effects, and version 7 adds a slew of new features that should see it taken considerably more seriously. Perhaps the most significant upgrade is that the software is now 64-bit (with a 32-bit version still included). Mixcraft 7 comes in two versions - Mixcraft 7 and Mixcraft Pro Studio 7 - differing only in that the latter includes more plugins. "This latest version represents a particularly big step forward. If you're already a Mixcraft user, upgrading is a no-brainer"
The new Performance Panel opens just to the left of the track lanes. Here, clips and loops can be dragged or pasted into a grid from Windows Explorer or Mixcraft's own project tracks, where they can be triggered individually or as vertically aligned 'sets'. This is great fun for live jamming, and you can record your triggering performances to the project tracks. It's obviously inspired by Ableton Live and, like that program, is fast, intuitive and inspirational. MIDI controller support has been expanded significantly, with newly-added support for a range of non-standard units including the Frontier Design Tranzport, Novation Launchpad and anything using the Mackie Control protocol. Related to that, Mixcraft now allows viewing of multiple automation lanes at once. Again (and like pretty much every other DAW on the market over the last few years) taking a lead from Live, Mixcraft 7 sees the introduction of Audio Warping and Audio Quantization. Both work well, as do the new and improved Time- Stretching and Pitch-Shifting algorithms. As for MIDI programming, the Piano Roll's new Step Editor enables beats and patterns to be constructed on a grid, with drums or notes listed down the left-hand side, and each 'lane' assignable to any MIDI note. Patterns can be sent as clips to the Performance Panel or any position on the host track. Intuitive and familiar. Mixcraft's roster of bundled instruments and effects keeps on growing, with new additions headlined by two new samplers and the wicked ME80 V2 from Memory Moo - an emulation of the mighty Yamaha CS-80 synth, now with 64-bit support, a new look and improved sound. There's also Glass Viper, a nifty digital synth that enters DX7 and D-50 territory with its crystalline, atmospheric sound. Also worthy of mention is the playback-only Journeys, powered by Applied Acoustics Systems' modelling technology, which delivers plucked strings and winds, and excellent percussion sounds. Mixcraft's effects have been given a boost, too, with the addition of Studio Devil's slick Virtual Bass Amp, Fusion Field convolution reverb, SideKick6 sidechain compressor and a dozen more, bringing the Pro version's total up to 20 instruments (15 in the standard version), and 52 effects (25 in standard). It's a solid enough package, but do be aware that some of them can be had for free or cheap elsewhere. Through its six major updates, Mixcraft has evolved from a basic starter app to a genuinely impressive DAW, taking on features normally associated with costlier alternatives - and this latest version represents a particularly big step forward. If you're already a Mixcraft user, upgrading is a no-brainer. If you're not, you really ought to give the demo a try.